Brigadier General Lytle and his brigade make a stand against Deas and Anderson’s Brigades on the hill that will thereafter bear his name. Walworth’s brigade gets into line and engages the left of Anderson and the right of Manigault. The 15th Alabama, attempting to get into the fight, fires into the back of the 19th Alabama. Once it realizes its mistake the regiment moves to the right of the line to help. 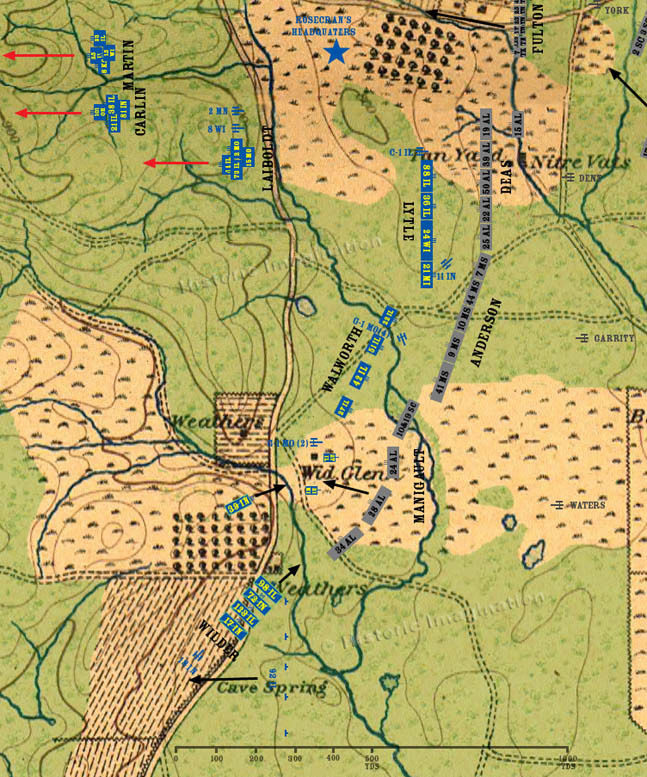 At the Widow Glenn cabin, Manigault is temporarily halted by Walworth to the north, but the 28th and 34th Alabama advance to outflank the skirmishers, and one section of the Battery G, 1st Missouri that remained behind. However, reinforcements are on the way. The 39th Illinois Mounted Infantry, armed with Spencer repeating rifles, arrives from Crawfish Springs and begins dismounting on the other side of the hill. The head of Wilder’s Lighting Brigade moves closer to the flank of the unsuspecting 34th Alabama.